Pearces Hardware was founded in 1938 by Mr. Merty Pearce. The business traded from 21 High Street which is now a jewellers. The rental was 27/6p per week! During the war, Mr. Pearce left his wife in charge of the shop and used his carpentry skills assembling Hurricane fighters in Princes Risborough. In 1943 the business moved to a part of the existing site and occupied no 8, with a small shop of about 17 m2 (180 square feet) behind the right hand or northern window of the current shop. The left hand or southern window was let to a Radio Spares business and the two floors above the shops were let to residential tenants. The two story buildings at the rear were used as storage and garaging for residents above the shop. In 1953 the freehold was purchased. The southern shop continued as a radio and now TV shop, and then to a laundry. 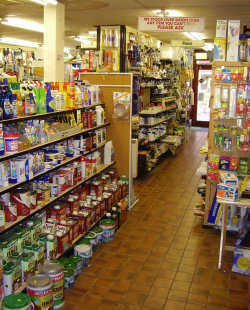 Mr. Pearce’s son, Ken, joined the business in 1959 after serving an apprenticeship at Robert Dyas. We still have customers who remember young Ken delivering paraffin through the town in his early days. The family took over 6 High Street from the laundry in 1963 and extended the shop southwards by removing the High Street access to the flats above and giving them a door from the rear of the building. The yard at the rear was surfaced in 1966. The final phase of building was undertaken by Ken in 1984 when a flat roofed extension was built to extend the shop backwards. The shop now extended to an irregular 145 m2 (1600 sq ft).The flats upstairs had been unoccupied since 1974 and this allowed the removal of the rear door and staircase. What was effectively emergency access to the flats was provided from within the shops. Mr Pearce Senior passed away in 1995 aged 88. Mr. Ken Pearce looked forward to retirement and put the business up for sale as a going concern. The present owners bought the business in 1998 and have tried to continue the tradition of service to the town for which the Pearce family were so well known for so long.